This last week I have spent an enormous amount of time getting ready for my favorite craft show of the year: the INDIEana Handicraft Exchange! The summer show will be held this Saturday, June 12, from 12pm-8pm at the Harrison Center for the Arts at 16th and Delaware in conjunction with the Independant Music and Arts Festival. Over 100 vendors will be on hand to showcase their handmade jewlery, clothing, plush toys, soaps, cross-stitches, and there will even be delicious edibles from vendors such as the Hot Cookie, who was recently featured in Ready Made Magazine! Before I head to the IHE, I thought I’d take a moment to share with you some of the new goodies I’ll be bringing along. There’s a lot, so I hope you like pretty pictures, and I really can’t wait to see you this weekend! Also, don’t forget, that the first 50 people in line at the IHE table in the gym when the show opens at noon will get awesome reusable tote bags filled with IHE vendor swag. If you happen to be one of the lucky 50, bring your Sunday Afternoon Housewife postcard to my booth (Booth #63 in the Gallery#2) and claim your free goodie! I’ll see ya Saturday! 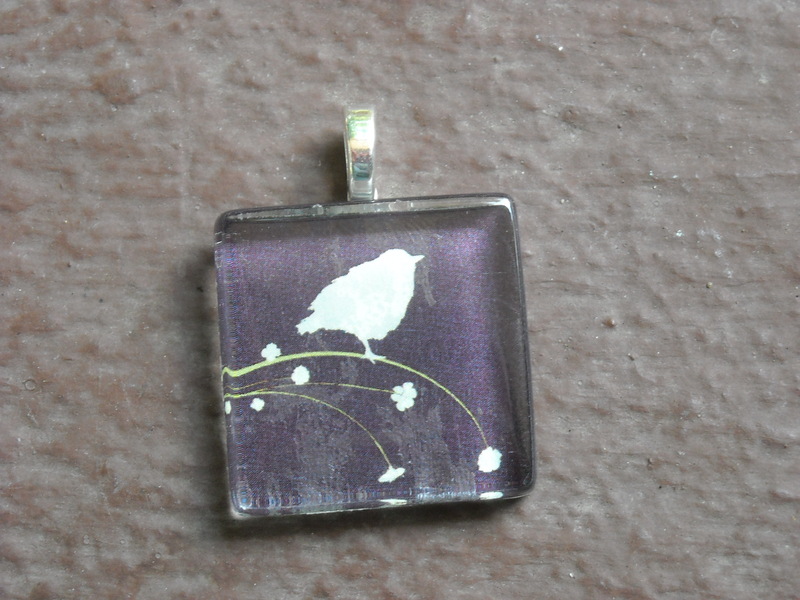 One of my favorite things to make next to my Scrabble Tile pendants are glass tile pendants. They are fun, easy, and always look great when finished. 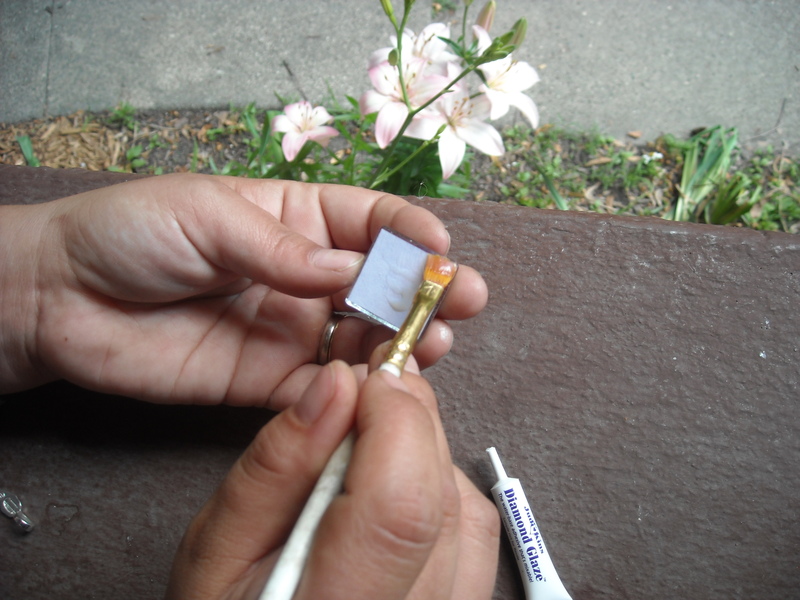 A couple of weeks ago I taught a class at Mass Ave Wine Shop on how to make glass tile pendants, and there was lots of interest in where to supplies came from because everyone wanted to make more than just one! I thought about it and decided that I would write this tutorial as a reminder for those who were in the class, as well as those who could not make it, and also start offering glass tile pendant kits (more on that below!). So, if you are interested in making a nice glass tile pendant for yourself, it’s a really simple process and the all you need to know for how to do it is right below! A variety of glass tiles are available from shops on Etsy. Glass tiles: There are lots of options here- I mainly use 1″ glass or circle tiles, but there are also rectangles, ovals, and many different sizes available. One good source for glass tile pendants is Etsy, search under supplies for glass tiles, and many options will come up. Bails: The most common type of bail is an Aanraku bail. These are widely available on Etsy. There have also been lots of new bails introduced on the market recently, and these types of glue-on bails are even now readily available at Hobby Lobby. Glue: You have two options here for adhering the image to the tile, you can use either Mod Podge or Judikins Diamond Glaze. Mod Podge is easily purchased at any craft or hobby store, while I have only been able to find Judikins Diamond Glaze online. Again, Etsy is a great place to purchase both. Adhesive: Also a glue, but this type you will need for adhering the bail to the glass tile. I have only every used and highly suggest E-6000. This type of adhesive provides a very strong bond between the bail and the glass tile. Images: What are really fun about glass tiles is that you can put anything on it! You can use a favorite photograph, a found image, or you can easily purchase fun images from Etsy by searching for “digital images” under supplies. Paint Brush: You’ll just need one to paint the glue on. It doesn’t have to be any fancy kind. Chain: Of course most pendants are going to need a chain. I provide a ball chain necklace with my glass tile pendants, but you can use any kind of chain that you have already, or you can purchase a chain off Etsy or at stores like Hobby Lobby or Michaels. 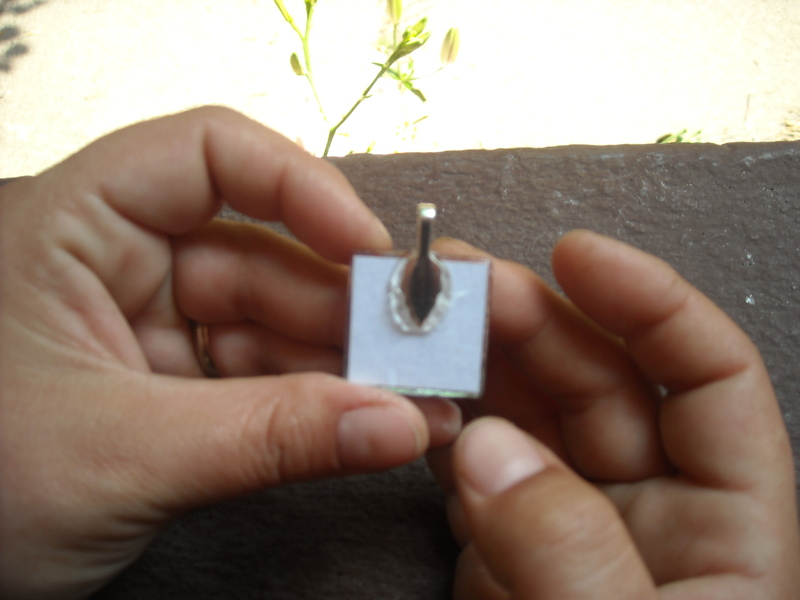 Ok, so now that you have all your supplies in order, it’s time to make your pendant. Step one is to cut the image you have selected to the right size to fit on the tile. Once your image is cut, you will be ready to glue it onto the tile. The tile normally will have two distinct sides- one will be smooth and the other will be slightly bumpy. You will use the Judikins or Mod Podge to glue the image onto the the bumpy side face up so it is viewable through the clear clear side. Act quickly when gluing on the image, and don’t skimp on the glue. If a little bit squishes out the side, you can wipe it off right away, or easily scrape it off when it dries. Make sure you press the image very hard up against the glue and glass so that it makes a tight bond and to ensure there are no air bubbles. Allow the glue to dry. Apply two layers of diamond glaze to the back side, allowing each to dry before moving onto the next step. After it drys, you’ll want to put two coats of glue on the back side of the image. Make sure you are careful to get it on all the edges really well and put good coats over the back (though do make sure you are letting it dry between coats!). Once the glue has dried, it’s time to attach the bail. Use the E-6000 to adhere the bail to the back center of the tile and allow it to dry. It will take a bit longer than you expect, so let it dry throughly. Press bail firmly to the center back of the tile. 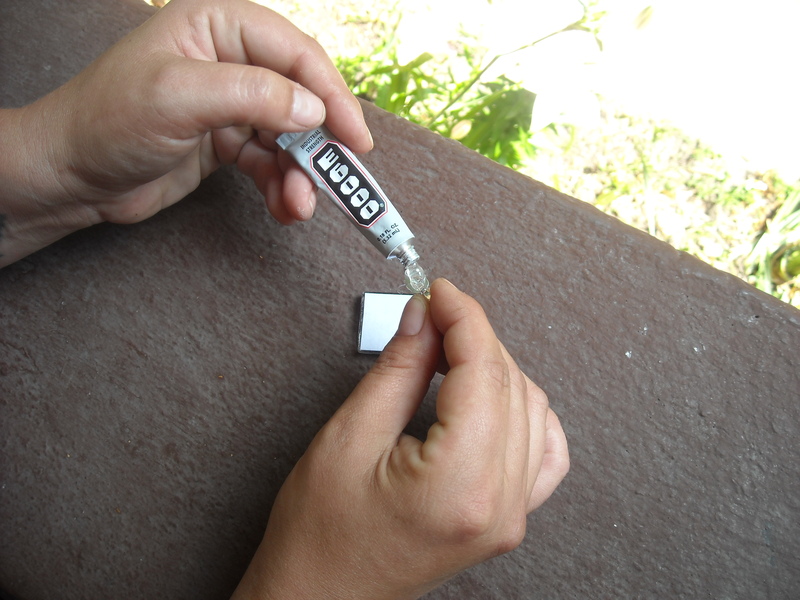 Excess glue can be easily peeled off after it is dry. 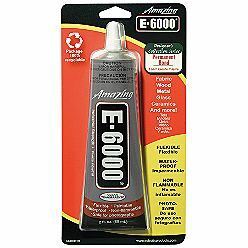 Once it is dry, any excess E-6000 that oozed out can be easily peeled off. If you got any excess glue anywhere on the tile, you can use your fingernail (or I guess like a nail file or something more official!) to scrape off the dried glue. Put it on your chain, and that’s it! You’ve made yourself a glass tile necklace! 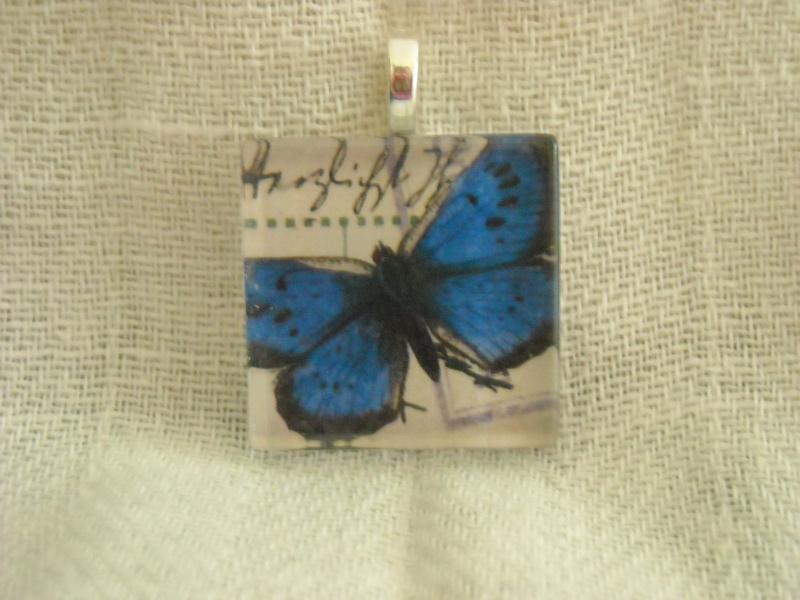 Your finished tile is now ready to be put on a chain and around your neck! Now that your necklace is finished, you can wear the heck out of it and brag to all your friends about the awesome necklace you made for yourself! Disclaimer: Remember to take it off before you go swimming, get in a hot tub, or take a shower, or else you will totally ruin it. 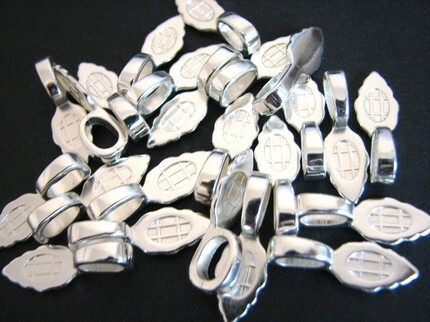 So, now you know how to make the necklace, but you still need the goods? I know if you only want to make one, you could spend upwards of $30 on supplies and shipping, so I’m making it really easy by offering you the brand new Sunday Afternoon Housewife Glass Tile Pendant Kit! 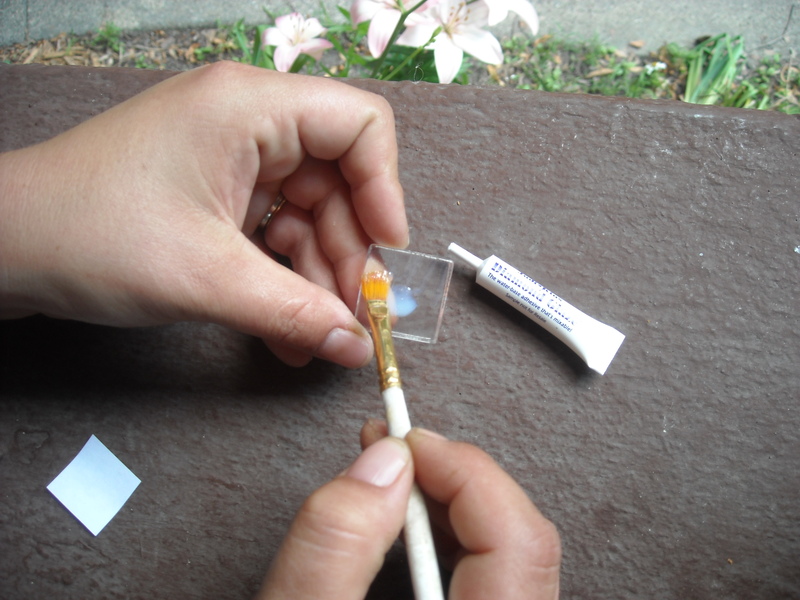 This kit includes everything you need to make your own glass tile pendant. It comes with 1 glass tile, 1 bail, 1 chain, 1 tube of Judikins Diamond Glaze, 1 tube of E-6000, 5 pre-cut and hand selected images, and a sheet of directions. It comes packaged in a super cute take-out style box which makes it great for gift giving as well as keeping for yourself and all for the great price of $10! It saves you the hassle of having to shop around, and it also comes with my personal supplier list, so if you decide you want to make more, you’ll know where to get the best deals! Click on over to my Etsy and get your kit today, or come see me at any of my upcoming fairs to pick up a kit for yourself or a friend!